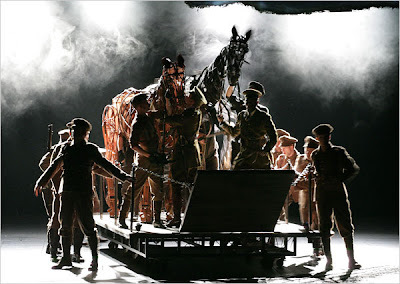 Today's New York Times takes us beneath the incredible horse puppets created for the London production of "War Horse," a play about a poor boy who loves a horse that is sold to a British officer who rides it off to WWI battles. The poor boy, shattered, enlists in hopes that he'll find his dear friend. 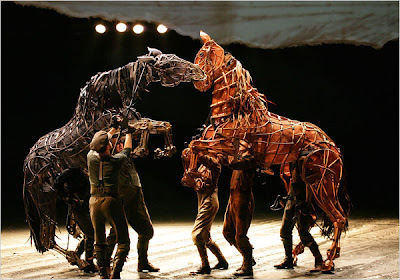 It's supposedly incredible and heart wrenching and full of never-before-seen puppet mastery. It's expected to hit New York in 2011. Giddy up. 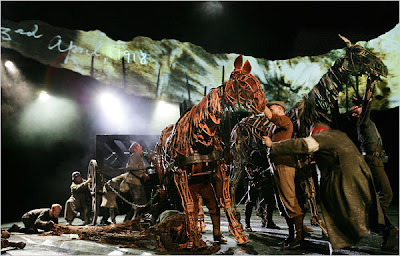 Thank you so much for including the video of WarHorse. The images in the NYT this morning were so compelling. Clearly it will come to Broadway. I just recommended that a friend who is leaving for London tomorrow BOOK tickets. seriously, this blew my mind. so much beauty. painfully so.